MCE Technologies LLC this week released a DVD-R/RW video authoring and data solution for Apple PowerBook (FireWire/Pismo) and PowerBook G3 (Bronze Keyboard/Lombard) machines. The MCE Expansion Bay DVD-R/RW drive includes Macintosh DVD-authoring software for the creation of DVD-Video discs, playable in most home and computer DVD players, in addition to software for burning data DVDs of 4.7 GB and CDs of up to 700 MB. The MCE Expansion Bay DVD-R/RW drive is a truly portable DVD-Video and data solution that fits into the PowerBook's right-side expansion bay slot and can be used wherever the PowerBook is taken. The product is available for immediate shipment. "DVD recordable technology has finally reached the point of miniaturization that we can now offer a complete DVD-Video Authoring and data solution for previous generations PowerBooks, which still enjoy a large and very loyal installed base," stated Arnie Ramirez, president of MCE Technologies. "With our expansion bay DVD-R/RW solution these users can now join the ranks of PowerBook G4 SuperDrive owners and can author DVD-Video discs and store data on DVD data discs of up to 4.7 GB wherever they take their PowerBooks." Utilizing the most capable mechanisms available in the miniaturized DVD-Recordable form-factor, the MCE Expansion Bay DVD-R/RW drive writes to general-use 4.7 GB DVD-R media and writes and rewrites to DVD-RW media at 1x speed (1,350 KB/sec). In addition, it writes to standard CD-R media at 16x speed (2,400 KB/sec) and writes and rewrites to CD-RW media at 10x speed (1,500 KB/sec). The drive reads standard DVD-ROM media at 8x speed (10,800 KB/sec), reads CD-ROM media at 24x speed (3,600 KB/sec), and reads data stored on DVD-RAM discs at 2x speed (2,700 KB/sec). The MCE Expansion Bay DVD-R/RW drive is compatible with Apple's iTunes and Disc Burner software, but also includes Toast Lite, by Roxio, to facilitate faster and more efficient burning of data DVDs and CDs. In addition, the drive includes ImageMixer DVD, an entry-level DVD authoring software for the Mac. ImageMixer DVD software enables the creation of DVD-Video discs on both G4 and G3-based machines. Using this software, users are able to quickly and easily create customized DVD-Video discs containing video clips and slideshows using footage and images from a variety of different sources, including QuickTime movies, iMovie creations, DV video, digital photos, etc. and then burn DVDs directly from within the software. MSRP of the MCE Expansion Bay DVD-R/RW drive is $449. Comprehensive specification and compatibility information for the drive is listed on the MCE website. Resist the ordinary and get the most supercharged laptop backpack that's got it all. BooqPaq is the ultimate in laptop backpacks, designed for mobile technology, portable audio, and comfort. Based on the successful original, BP3 is the third generation BooqPaq, with optimized laptop protection, now with an entirely separate zippered laptop compartment lined with non-scratch fabrics. Booq implemented many customer requests and other powerful design improvements like more internal padding and interior pockets, we have created a lighter BooqPaq overall. BP3 is the state-of-the-art mobility solution for your PC laptop, 15" PowerBook G4, all your gadgets and gear. More than just an ergonomically designed laptop backpack, this supercharged gear center achieves extreme levels of design refinement, with among the highest quality of materials and finish. With its bombproof 1680D ballistic nylon exterior, neither the harshest weather nor the most abusive wear can harm this tough and laptop carrying case. Designed to be the perfect technology center and versatile laptop backpack with tons of storage options for your laptop and gear, MPEG-Player or CD-Player, media, digital camera and documents, this laptop backpack leaves plenty of cubic space for all your other stuff you'll need on your next trip. BP3 also makes for a great school backpack or college backpack with room for a stack of books six inches high. This backpack is comfortable to wear - - even for long hikes at heavy loads - - due to our unusually wide shoulder straps, attention to ergonomics and human factors in design. In fact, since we've paid special attention to female ergonomics, BP3 is an extremely comfortable women's backpack! While the actual laptop backpack is available in black, navy, and a cool gray, the pack's detachable front piece "Shell" comes in a variety of styles, so that you can build your personal BooqPaq, and change styles whenever you want. integrates interchangeable cover piece "Shell"
external front pocket stores up to 10 CDs, disks etc. large side pockets hold cables, pens, cell phone, water bottles, digital camera, etc. Keep what's over your keyboard from getting under it. Under the iBook or PowerBook G4 keyboard lie all the important electronics that make it tick. If anything gets in between your keys, it poses a serious threat to your computer's health. If you love your iBook or PowerBook G4, you will want to protect it against everyday hazards caused by spills, dirt, crumbs and other unwanted elements. The iSkin iBook/PowerBook G4 Keyboard Protector is precisely molded to fit and protect your keyboard by creating a protective barrier without restricting use of the keyboard. When washed regularly or removed before closing, the iSkin keyboard protector eliminates screen staining by reducing the occurrence of finger oils and dirt particles being transferred to the iBook/PowerBook screen. The iSkin iBook/PowerBook G4 Keyboard Protector is available in six translucent and two solid colors (skin tones). Skin Tones add a splash of subtle color to the keyboard. It is available in Blue Mist (light blue), Bubble Gum (light pink), Creamsicle (light orange), Lemonade (light Yellow), LimeLight (light green), or in White Frost (clear frosted). It is also available in opaque skin tones, Asphalt (black), and Snow (white) with printed keyboard characters. Designed to fit the Apple iBook (white 2001) / PowerBook G4 15" (550 MHz - 1 GHz) North American keyboard layout. The TiBook Case was specifically designed to carry the 15" PowerBook G4. Both lightweight and durable, the TiBook Case's sleek appearance is an excellent match with the sophisticated design of the PowerBook G4. Each case is handmade from 100% brushed aluminum, making each case one-of-a-kind. The low-profile design means the case is scarcely larger than the PowerBook G4 itself. This case features a sturdy metal handle, and the interior is lined with soft protective felt and features shock-absorbing resistance pads along the edges. The TiBook Case also comes with two keys which are used to securely lock down your PowerBook during transport. The TiBook Case is also available in a clear model, which features a top lid composed of transparent fiberglass in order to prominently display your PowerBook. WiebeTech announces DuoGB, which allows users to easily access two drives within a single external FireWire enclosure. The two drives will mount as separate drives under Mac OS 9 or OS X. Additionally, DuoGB takes advantage of the built in RAID capability of OS X, allowing users to effortlessly stripe or mirror the drives. The starting price of DuoGB is $179.95, making it very affordable; and it is available in capacities up to 2 x 250 GB (500 GB total). "Users have been asking for a product that allows two drives to mount from within one enclosure, and DuoGB fills that role spectacularly," said James Wiebe, CEO of WiebeTech. "DuoGB will also function perfectly as a high performance striped or mirrored RAID under OS X. As a result, we are offering a storage device with up to 500 GB (unformatted) storage capacity, all achieved without drivers and with really awesome performance. For OS X users, the process of creating a RAID is as simple as opening the disk utility and dragging both drives to the RAID tab, then assigning a name and clicking on create. It's that easy. "Performance is also great with this product," said Wiebe. "When running as a RAID under OS X, users may see benchmarks of up to 40 MB/sec, making this a speedy storage product for serious professional users running audio and digital video editing applications. Users will also enjoy having an enclosure that contains two drives, allowing massive amounts of storage in one enclosure." "We are extremely pleased to see WiebeTech deploy a product which highlights the ability of the Oxford OXFW911 to support two really big drives simultaneously," said James Lewis, president, Oxford Semiconductor. "Users of WiebeTech's DuoGB will take great advantage of FireWire and the Oxford OXFW911." OXFW911 bridge: One bridge supports two drives with full ATA-6 support, so that two drives up to 250 GB (each) and beyond may be used. Users may experience transfer rates of up to 40 MB/sec when configured as a RAID under OS X.
Driverless Design: This product is designed to install without drivers under most operating systems, easing the installation process. Aluminum / Metal Enclosure: Gorgeous case provides EMI protection and ruggedness in an enclosure which looks great. User Configurable: DuoGB is available in a configuration without drives, so that users may install a pair of their favorite IDE ATA-5 or ATA-6 drives. Fully self contained: Unit contains power supply; just attach AC cable and FireWire cable. 90-264 VAC transformer: World compatible power supply. Quiet Cooling: Unit contains quiet fan for great cooling with minimal noise. In the U.S. and Canada, dealers may purchase any configuration of MicroGB+ from Dr Bott LLC or from dealers. All configurations are in stock and available directly from WiebeTech. Canadian resellers may purchase products from EMJ. Fabio M. Zambelli of the Italian Mac Website Macity has posted an interesting article on being a reporter with an iBook in wartime. Zambelli chronicles what hardware and software tools and which tricks John Pendygraft, a reporter for Tampa's St. Petersburg Times, used to work with his faithful iBook as a correspondent in Iraq embedded with the US Marine Corps. John used an iBook 600 with 640 MB of RAM, a 30 GB hard drive, and Nikon D1 and D1H digital cameras, using Lexar Professional 512 MB Compact Flash memory cards in each camera, a Lexar FireWire card reader, and a Lexar JumpShot USB reader as backup. Software used included Adobe Photoshop 5.5, Camera Bits PhotoMechanic Pro 2.0, FileMaker Pro 4.1, AppleWorks 6, FTupperWare 2.3.1, Transmit 1.7, AOL Instant Messenger, Microsoft Internet Explorer as browser, and web-based Yahoo! Mail account for email. To communicate and send digital stuff to his Florida office, he used a NERA M4 World Communicator ($6,600) connected with the UK provider Inmarsat system covering the area with its Inmarsat-3 F2 sat. The connection was made through a USB cable, using the satellite phone as an external serial modem through "old" Mac OS 9's Apple Remote Access software and the "Metricom Wireless 64K ISDN" compatible modem driver. Other World Computing has introduced a new FireWire 800 external hard drive enclosure kit. Designed to support all 3.5" ATA/IDE hard drives, the new Mercury Elite Pro FW800/400 + USB 2.0/1.1 Enclosure Kit utilizes the Oxford 922 chipset and makes it possible to extend the usefulness/life of existing drives by making them FireWire and/or USB compatible. Priced at $179.95, the Mercury Elite Pro FW800/400 + USB 2.0/1.1 Enclosure Kit includes two nine pin FireWire 800 ports (IEEE 1394b), one six-pin FireWire 400 port (IEEE 1394a), and one five-pin USB 2.0/1.1 port. This enables data transfer speeds of up to 100 MBps, 50 MBps, 60 MBps, or 1.5 MBps, respectively. A timelessly elegant attaché coated with an exclusive PMMA protective layer to keep its outer gloss for years. Plus a removable cloth cover. 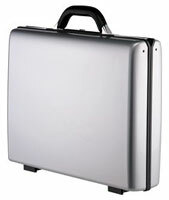 The Samsonite Classic 1000 Portchester 11 cm Attaché is made from a vacuum-formed or pressure- formed shell. Strong ABS plastic, a temperature-resistant, highly impact-resistant material, is combined with a textured finish for the classic hard side look. Designed to fit in most overhead compartments; may not conform to some carryon standards. Removable interior divider panels made of flexible fabric are designed to help create separate compartments inside your suitcase for added organization and security. Plus they can be removed and stored separately when not needed. Provide a convenient way to make travel more secure. Simply set your own numeric code and look the case when you've finished packing. Reenter your secret code when you're ready to unpack.